Many people take their light quality as seriously as their morning coffee. According to KNX Today, the task of specification has become less about what the fixture looks like and more about the light quality coming from it. As a result of individual point sources of LED indoor lighting, the beam of light distributed has become a bigger part of the design process and the structural components have become less so. In fact, companies like Vode Lighting have made it their goal to consciously minimize and reduce the lighting fixtures and related hardware. Lighting designers are not as concerned now about whether a pendant fixture has a brushed bronze finish as they are about how the light being presented can be used most effectively as part of the esthetic quality and functionality of a space. While LED systems are suitable for providing uniform washes of light, they can also be used to create diffused glows just as easily as precise beams with less wasted light. This allows a designer to create wide ranges of effects from sharp contrasts between shadow and light to atmospheric looking spaces with little indication of where the light sources are. 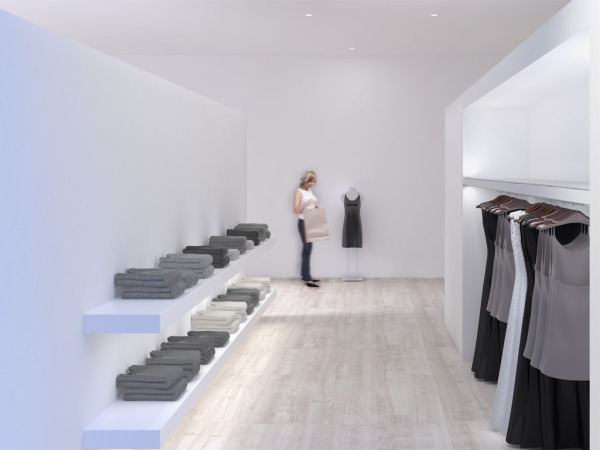 Undershelf and ultra low profile indirect lighting by Vode’s ZipOne LED 707 lighting system. The focus on light quality is evidenced through the increased specification of low profile lighting. Many designers are finding ways to hide fixtures in wall, ceiling and floor coves, slots and other architectural features so that eyes are drawn to the ways in which the light interacts with the architecture and not the hardware itself. Furthermore, the effects of color rendering, correlated color temperature and lumen output on mood are now more easily designed and manipulated for maximum effect. In fact, the Boston Globe published an article detailing tips for purchasing LED lighting, most of which were directed at light quality. Even at the consumer level, people are thinking about how 5000K lamps are better for task lighting and 2500K lamps and dim lighting are more suitable for relaxing familial environments. Why are LEDs at the forefront? The answer is simple: They're an all-in-one solution. They come in all ranges of color temperatures, offer near-perfect color rendering in some cases and some commercial LED lighting products even give users the ability to make real-time changes to the light quality. Industry experts believe LED technology is still at the Model-T stage in technological development.